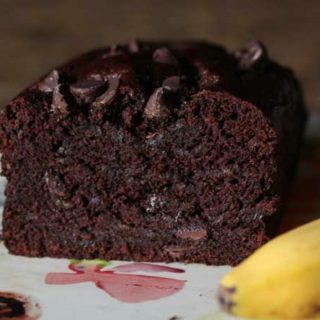 Mexican Chocolate Banana Bread is a rich tasting and very chocolate-y banana bread enhanced with a little cinnamon. 3/4 cup semisweet or dark chocolate chips. Preheat oven to 350°F. Grease and flour an 8 1/2 by 4 1/2 inch loaf pan or line the inside with nonstick foil. In a large mixing bowl, whisk together melted butter, oil, brown sugar and cocoa powder until smooth. Whisk in the egg, and vanilla. Whisk in baking soda, salt and cinnamon until fully blended. Add flour and stir until it is absorbed, then stir in mashed bananas and chocolate chips. Transfer to the loaf pan and sprinkle more chocolate chips on top if desired. Let cool in pan for 10 to 15 minutes, then loosen with a knife and let cool completely before removing from the pan. If you used a foil lined pan, just let it cool in the pan and then lift it out.